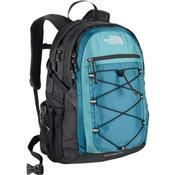 The North Face Women's Borealis is more than just a unisex pack in pretty colors. Women's-specific FlexVent shoulder straps are designed to fit narrower shoulders and not interfere with any delicate lady-parts as you crank out the miles. The comfortable chemise back panel is designed with a special spine channel for a natural fit and added back support. The hipbelt is padded and winged for extra support and can be stowed away when not in use. The padded laptop compartment will accommodate a 15 inch laptop to keep your investment safe and close.